Be PROUD of that “Minecraft Teacher” label (or whatever the label)…. A couple of days ago, I read a couple tweets from a teacher that was voicing thoughts about being labelled as a “Minecraft” teacher, rather than an Innovative teacher that uses many engaging and creative tools including Minecraft. I looked back through the Twitterverse, but couldn’t find the tweets again. F irst, I think that any teacher, leader or principal that is labelled a Minecraft teacher should be EXTREMELY proud. Bring it ON! Think about it. You are being labelled as a teacher that is creative, open-minded, collaborative and willing to use tools and methods that are engaging and encourage students to venture into ARTS, DESIGN, ENGINEERING and MATH! Not to mention, using a tool that lends itself well to having students THINK, REACT and ADAPT to certain situations. And to further the point, you are using a tool that is Universally Designed and doesn’t restrict students that have literacy barriers or language barriers. So, if people see you as a MINECRAFT TEACHER, then I suggest you thank them. Maybe they just don’t understand what a compliment they gave you! I find myself thinking more and more about the assumptions that are made about teachers that research, share, blog and reflect on specific technology tools they use as part of the learning and teaching process. In fact, sharing specific examples about the tool or program on Social Media can have an interesting result since the context isn’t always obvious and assumptions get made about the teacher. For example, The Minecraft Teacher, The Smartboard Teacher, The Livescribe Teacher, The Google Teacher, The iPad Teacher…… You get the point. But who cares? I am certain that I’ve been labelled a certain “kind” of teacher. I suppose it depends on who and from when. Today, I might be considered the “Minecraft Teacher”. I delivered several Smartboard workshops for my District about 10 years ago, so back then, I was the “Smartboard Teacher”. About 8 years ago, I started using blogging platforms with my students, so those who know me then, might consider me the Blogging teacher, or the Skyping teacher since we used Skype so often. A couple of years later, I began incorporating tools that were Universally Designed, such as audio amplification systems. I used the Front Row system and had a microphone around my neck most of the day. Yes, for a while, I was the Front Row teacher. And then, there was the iPad. My iPad ‘ONE” was the only iPad in the school (of 700) for 2 years. This single iPad labelled me as the iPad expert. 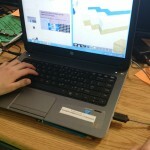 In 2006, my students were using Scratch and Robotics and even for a short while, I was seen as the Programming Teacher. Then, there was the Livescribe. Another action research project that had me integrate the tool in ways that I still find myself attached to, especially around assessment. 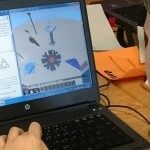 Recently, I’ve been investigating and integrating a variety of Microsoft tools into the classroom. Maybe that makes me a “Microsoft” teacher too. Doesn’t it seem like the technology tools and innovations that we blog and tweet about seemed to override everything else we do as teachers? as leaders? as learners? Do we take the time to sift through our assumptions, to get to know the person and understand why they use the tools or methods they do? Why the “act” the way they do on Social Media? Who are they really? I now use all of these tools or program as part of the teaching and learning process, depending on the situation, the student and the context. Those of have taken the time to know me, know that I am NOT an expert, but am willing to try out as many tools as possible in hopes that I can reach my students in a way that supports higher order thinking, inquiry, and depth. My classroom focuses on collaboration and inquiry, not technology, not Minecraft, not Livescirbe, not Smartboard, not Coding, not Google, not robotics… (you get the point). I am good with the many labels that are attached to my name and I’m even good with the fact that I have probably used these tools for “Subtitution” (SAMR) on occasion. But…I used them and I continue to learn. Back to the “Minecraft teacher “ and for all the “Minecraft teachers” out there, be proud of your label, because you ROCK. You are taking risks, trying new things, engaging your students and putting yourself out there to be scrutinized and judged…and still, you do it. Remember, it is most often due to the ignorance or lack of understanding of you and your practice that results in the LABEL, not you! I wonder, what ASSUMPTIONS, based on interactions in Social Media, about educators, leaders or others in your network, do you have? What assumptions do you think are made about you?